Line a baking sheet with aluminum foil and coat with olive oil. Roll potatoes in oil on baking sheet, add salt and pepper and roll again. Pierce each potato gently with a fork a couple of times, and bake for an hour. Remove from oven and cut lengthwise. Allow to cool for 10 minutes. Scoop out potato into a mixing bowl leaving a ½ inch of potato near skin. 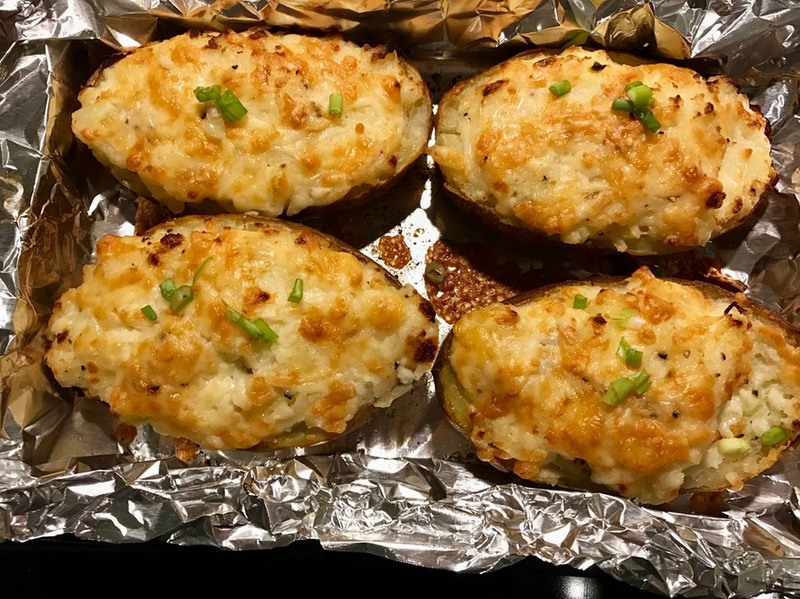 Return potato skins to pan. Mash scooped potato with a potato masher or fork to get out most of the lumps. Add garlic, butter, sour cream, green onions, half of the cheese, and salt and pepper. Mix well (taste for seasonings) and add back into potato. Bake for 10 minutes to melt cheese – you may want to broil it for 30 seconds to really get it brown.